Objective: Azilsartan medoxomil is considered as a prodrug of the active metabolite, azilsartan which is an angiotensin II receptor blocker that can be utilized for the treatment of mild to moderate essential hypertension. Azilsartan medoxomil is classified as class II according to the biopharmaceutical classification. This study aims to prepare nanosuspension of azilsartan medoxomil to improve its solubility. Method: Solvent anti-solvent precipitation with ultrasonication method was utilized to prepare azilsartan medoxomil nanosuspension. Different stabilizers (TPGS, and PEG6000) alone at a different drug: stabilizer ratio or in combination with other co-stabilizer (Tween80 or SLS) are used in formulations. Effect of other parameters such as stirring speed of the antisolvent and using of ultrasonication power also was investigated. Azilsartan medoxomil nanosuspension were characterized for particle size analysis, the percentage of drug entrapment efficiency, atomic force microscope and in vitro dissolution study. Also to develop stable and suitable oral dosage form, the optimized formulation was freeze-dried into self-dispersible dry nanosuspension and then evaluated. Results: The best formula (F13) has a particle size of 48.7 nm containing PEG6000 as the main stabilizer and Tween80 as co-stabilizer at a drug: stabilizer:co-stabilizer ratio 1:0.75:0.25 with stirring speed of antisolvent system at 3500 rpm. % entrapment efficiency was ranged from 80% ± 1 to 97% ± 1. For self-dispersible dry nanosuspension, the selected formula (F13m) when using mannitol as cryoprotectant showed fast dispersibility in 1 minute in dissolution media and complete in-vitro dissolution in less than 30 minutes in both media (0.1 N HCl and phosphate buffer solution (pH 6.8)). 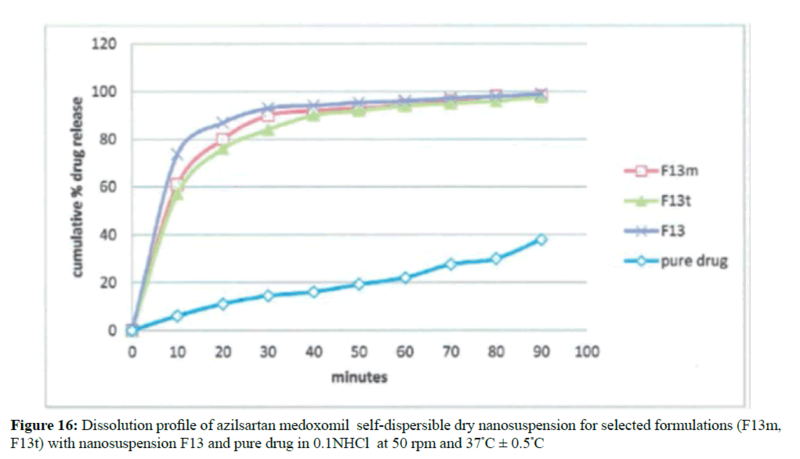 Conclusions: from the study we conclude antisolvent-precipitation with ultrasonication method is an efficient method to formulate azilsartan medoxomil nanosuspension and easy to formulate azilsartan medoxomil self-dispersible dry nanosuspension with high solubility and dissolution rate. Several new pharmaceutical products that developed in the last years classified under class II of the biopharmaceutics classification system for which their poor solubility in the gastrointestinal tract is the limiting factors for their oral absorption. Many of these compounds are considering candidates for pharmaceutical development because of their insufficient oral absorption and low bioavailability . Nowadays there are many formulation strategies available to solve the problems of low solubility and enhance the dissolution rate of the hydrophobic drugs. The conventional methods include micronization, use of co-solvents, surfactant dispersion, salt formation, and others but still, these techniques having limited usefulness in solubility enhancement for poorly soluble drugs . With the need to increase the drug solubility, drug particle size reduction seen as the most promising approach leading to a new era of nanotechnology. Nanotechnology can be used to solve the problems associated with various methods described in conventional approach . Nanosuspension technology applied to poorly soluble drugs that are insoluble in both water and oils. The term nanosuspension refers to a disperse system consisting of pure drug substance particles with particle size of the solid range of 10–1000 nm dispersed in an aqueous medium with small amounts of molecules on their surface providing steric or ionic stabilization for either oral and topical use or parenteral and pulmonary administration . Azilsartan medoxomil is a prodrug that is rapidly hydrolyzed to azilsartan, the active metabolite, during the gastrointestinal absorption phase. It is practically insoluble in water, freely soluble in methanol and dimethylsulfoxide, and soluble in acetic acid. This compound has pKa 6.1 and log P equal to 5.7t is considered as selective AT1 subtype angiotensin II receptor blocker (ARB) and can be described for the management of mild to moderate cases of essential hypertension [5,6]. Figure 1 shows the chemical structure of azilsartan and azilsartan medoxomil. Figure 1: Chemical structure of A- Azilsartan Medoxomil B-Azilsartan . The study aimed to formulate a nanosuspension of particularly insoluble angiotensin type 2 blocker azilsartan medoxomil to enhance its dissolution rate. Also studying the effect of different formulation variables to select the best formula with appropriate physical properties for the preparation and characterization of dry self-dispersible nanosuspension of the drug. Azilsartan medoxomil (99% pure) and tocopherol polyethylene glycol1000 succinate (TPGS) were purchased from Hangzhou, Hyper Chemical Limited, China. Mannitol and Trehalose were purchase from Jk. Chemical. China. Polyethylene glycol 6000 provide fromSinopharm, Chemical Reagent Co., Ltd, China. Sodium lauryl sulfate (SLS) was purchased from S. D Fine-Chem limited Mumbai, India. Polysorbate 80 (Tween 80) ® from Scharlau S.L Spain. All other chemicals and solvents were of analytical reagent grade, and deionized water also was used in this study. An amount of 10 mg of azilsartan medoxomil pure powder was dispersed in 100 mL 0.1 N HCl containing 0.5% Tween 80 to prepare a stock solution of 0.1 mg/mL from which, a dilute solution was drawn up and scanned at the range of 200-400 nm by UV spectrophotometer. The same steps repeated with phosphate buffer at pH 6.8, water containing 0.5% Tween 80 and methanol to obtain the λmax of azilsartan medoxomil in these media. 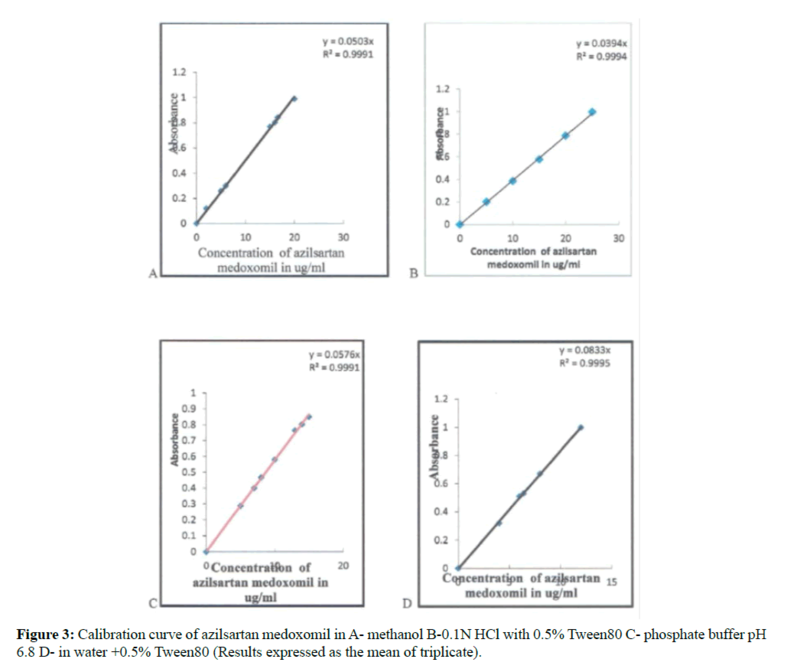 Calibration curves of azilsartan medoxomil were constructed in different media including 0.1 N HCl with 0.5% Tween 80, water with 0.5% Tween 80 phosphate buffer (pH 6.8), and methanol by preparing serial dilutions of the drug from the stock solution for each medium . Saturation solubility of pure azilsartan medoxomil powder determined in different media such as 0.1 N HCl, water, and phosphate buffer (6.8). All media were prepared, and excess of azilsartan medoxomil was added to each of them and kept in an incubator shaker at 25°C, and after 48 hrs, the solution was centrifuged at 4000 rpm for 30 min. Supernatants were filtered and diluted with the particular solution. Absorbance measured at a wavelength specific to each media using UV- spectrophotometer and solubility was calculated according to calibration curves . Oral nanosuspension of azilsartan medoxomil is prepared by solvent anti-solvent precipitation method using different types and concentration of stabilizers and co-stabilizers. In brief, 40 mg of azilsartan medoxomil dissolved in an organic solvent which is 3 ml methanol). In another hand, 40 ml of deionized water containing stabilizers (TPGS or PEG6000) alone in different concentrations or combination with co-stabilizers (Tween 80 or SLS) at a constant level, which acts as the antisolvent system. This step was followed by the addition at a slow rate (1 ml/min) of the organic solution into aqueous solution by the help of syringe pump, under mechanical agitation of different speeds (3500, 1200 or 300 rpm) using homo disperser . Some of the formulations after precipitated from the anti-solvent are subjected to ultrasonic power using probe sonicator at 400 watts for 20 min. The period of ultrasound burst set to 3 s with a pause of 3 s between two ultrasound bursts. After that, the sample was transferred to a magnetic stirrer at low stirring speeds for one hour at 53°C to allow organic solvent methanol to evaporate and get the coveted nanosuspension . The batches prepared according to the formulation design (Tables 1 and 2). Variables affecting the formulation of azilsartan medoxomil nanosuspension include: Effect of polymer type on azilsartan medoxomil nanosuspension, the effect of polymer concentration on azilsartan medoxomil nanosuspension, the effect of the addition of co-stabilizer on azilsartan medoxomil nanosuspension and effect of ultrasonic power on the formulations of azilsartan medoxomil nanosuspension. Particle size and polydispersity index determination are done by using the NanoBrook 90Plus particle size analyzer. It is a dynamic light scattering and can give different choices for analysis. The first one is the determination of the average diameter (Eff. Dia.) and the Polydispersity index which is sufficient for many applications . Zeta potential of the selected formulations of azilsartan medoxomil nanosuspension was measured using The Nano Brook 90Plus zeta sizer (Brookhaven Instruments USA). The samples were diluted ten times with solvent before analysis . It can scan the surface morphology of nanoparticles and can indicate the particle size of the nanoparticles accurately. Droplets of optimized formulas were deposited on freshly cleaved mica and dried 15 minutes in the oven by the droplet evaporation technique. Particle size, 3D-dimension graph, and a histogram of particle size distribution were obtained . The selected formulations were freeze-dried to obtain a dry powder for further investigation. In addition to that selected batch was taken to study the effect of cryoprotectant on freeze-drying and dispersibility of the prepared nanosuspension. Mannitol or trehalose both at a concentration of 5 times the total solid contents in the formulation used as a cryoprotectant. Three sample of nanosuspension each contain 100 mg azilsartan medoxomil were placed in a flask, the amount of mannitol required added to one and shaken to dissolve, the same quantity of trehalose added to the other sample, the third sample left with out of cryoprotectants. These flasks were frozen in a deep freezer at –20°C for 12 h for primary freezing. Then the container was attached to the vacuum adapter of the lyophilizer. The solvent sublimed under a pressure of 80 mmHg for 48- 72 h .
The resultant freeze-dried powders corresponding to 10 mg of azilsartan medoxomil were directly placed in 10 mL of the aqueous medium in a glass vial and stirred by a magnetic stirrer for 3-5 minutes at 37°C ± 0.5°C. The first fluid 0.1 N HCl and a second liquid phosphate buffer (pH 6.8) were used as a dispersing medium to correlate to their dissolution behaviors described later. The PSD of redispersed drug particles was measured to assess the self-dispersing property (self-dispersibility) of the freeze-dried powders . The saturation solubility study of dry lyophilized powder of the selected formulation obtained after freeze-drying performed with water, 0.1 N HCl and phosphate buffer pH 6.8 solutions by dissolving the excess amount of lyophilized powder in 10 ml of these solutions. The mixture was shaken for 48 hours at 25°C then filtered and the filtrate diluted so that can be analyzed using UV-visible spectrophotometer at a λmax of azilsartan medoxomil and the amount dissolved calculated from the respected calibration curve . In-vitro drug release of formulations was performed using USP dissolution apparatus II in 900 ml of dissolution medium at 37°C ± 0.5°C and the speed of the paddle was adjusted to 50 rpm. Volume containing 40 mg of azilsartan medoxomil of optimized formulations of the freshly prepared nanosuspension placed in a pretreated dialysis bag (Schuchardt dialysis membrane (MWCO 12000 Da. )).The optimized formulations of azilsartan medoxomil nanosuspension subjected to the drug release studies in two media (0.1 N HCl and phosphate buffer (pH 6.8)) in comparison with lyophilized powder of self-dispersible dry nanosuspension of the selected formulation and pure drug . Similarity factor (f2) was utilized in comparison of dissolution curves according to the following equation by Moore and Flanner . Where n refers to the number of dissolution time points, RT the reference dissolution values and Tt the test dissolution values at time t.
Powder X-ray diffraction can be used to emphasize the crystalline nature of the substances. So, this information is used to confirm whether the materials are crystalline or amorphous. The diffractograms of azilsartan medoxomil pure powders and lyophilized self-dispersible powders of the selected formulations obtained for analysis using Shimadzu XRD-6000 powder X-ray diffractometer at continuous scan range of 10-80 degree; the operating voltages were 40 (kV) and current 30 mA . Fourier–transform infrared (FTIR) spectra of pure azilsartan medoxomil powders and lyophilized powder of the selected formulations were done using FTIR spectrophotometer (FTIR -8300 Shimadzu, Japan) by potassium bromide (KBr) pellet method . Three patches of the lyophilized powder of the selected formulation (best one) containing 40 mg of azilsartan medoxomil were filled in capsules and stored at three different temperatures: 40°C, 50°C, and 60°C for 12 weeks. At an interval of 2 weeks, samples were taken and dissolved in 10 ml methanol, and then the concentration of the drug was determined spectrophotometrically at λmax keeping methanol as blank. Then from the Arrhenius plot, K25 was predicted, and the accelerated expiration date can be calculated . The results of the study were expressed as a mean of triplicate samples ± standard deviation (SD). They were analyzed statistically according to one-way analysis (ANOVA) of variance to show if the results of study significant results when (P< 0.05) or it is not significant when (P>0.05) . The construction of UV spectrum for azilsartan medoxomil in acid 0.1 N HCl solution containing 0.5%w/v Tween 80, and phosphate buffer pH 6.8 display the same λmax at 248 nm as shown in the Figure 2 for HCl while it was 250 nm in methanol which identical to the published one . Figure 2: UV spectrum of azilsartan medoxomil in acid 0.1 N HCl with 0.5% Tween 80. The constructed calibration curves of azilsartan medoxomil in methanol, 0.1 N HCl with 0.5% Tween80, phosphate buffers (pH 6.8) and water with 0.5% Tween as shown in Figure 3. Figure 3: Calibration curve of azilsartan medoxomil in A- methanol B-0.1N HCl with 0.5% Tween80 C- phosphate buffer pH 6.8 D- in water +0.5% Tween80 (Results expressed as the mean of triplicate). Results show poor solubility of azilsartan medoxomil pure powder in all media as shown in the Table 3 which is in agreement with published research. The particle size and polydispersity index (PID) of all the prepared formulas of azilsartan medoxomil nanosuspension characterized by Nano Brook 90Plus, Brookhaven particle size analyzer. The mean particle size (effective diameter) for each formulation was determined. Polydispersity index is considered as a parameter to realize the particle size distribution of nanoparticles obtained from a particle size analyzer. Lower PDI value indicates monodisperse samples, whereas the polydisperse sample have higher values of PDI and this indicates a wider particle size distribution . The impact of various variables on the particle size and polydispersity index of azilsartan medoxomil nanosuspension was studied using 27 different formulations. From the results, all the prepared formulations were in the nano size as shown in Table 4. Several formulations were prepared to show the effect of using TPGS and PEG6000 as the main stabilizers at four different concentrations on azilsartan medoxomil nanosuspension. PEG6000 are homopolymer stabilizers for nanosuspensions; they stabilize the system by steric stabilization . TPGS and tween 80 (nonionic surfactant) are electrostatic stabilizers stabilized the nanoparticle by countered Vander Waals attractions between particles, additionally promotes wetting and dispersion of the drug particles, which are usually very hydrophobic . The effect of these stabilizers on particle size varied according to the ratio of drug to the stabilizer as shown in Figure 4. 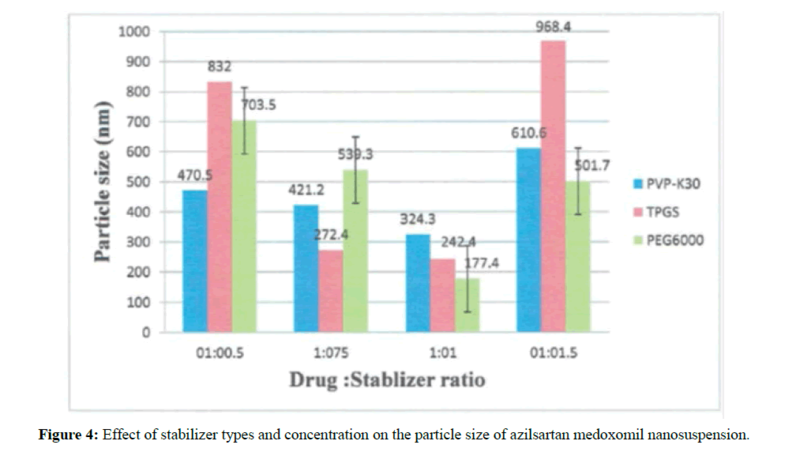 Figure 4: Effect of stabilizer types and concentration on the particle size of azilsartan medoxomil nanosuspension. These vary in particle size for different stabilizer attributed to the sufficient or insufficient affinity of stabilizer to drug molecule . Polydispersity index values for these formulations ranged from 0005-0.27 indicate that these formulas are mid-range polydispersity system. The results showed that for all types of stabilizer used, particle size reduced with the increasing of stabilizers concentration. The reason for this is that high stabilizer ratio decreases surface tension and stabilizes newly formed surfaces during precipitation process and make nanosuspension of smaller particles size and this indicated that the stabilizer molecules sufficiently wrapped the drug particle surface. While at a low or insufficient concentration of stabilizer will cause instability and recrystallization . Two different stabilizers (sodium lauryl sulfate and tween 80 ) at a constant of drug: stabilizer: co-stabilizer ratio 1: 0.75: 0.25 were used. Formulations F3-F4 and F12-F13 were prepared to show the effect of the addition of co-stabilizer on PS and PDI of azilsartan medoxomil nanosuspension as illustrated in the Figure 5. Figure 5: Effect of addition of co-stabilizer on the particle size of azilsartan medoxomil nanosuspension. The combination of stabilizer and co-stabilizer provide either electrostatic-steric or electrostatic–electrostatic mechanism as, electrostatic and steric stabilization can be represented as electrostatic stabilization. For formulation that has TPGS as a primary stabilizer as in F2 that has particle size 272.4 ± 9.3 nm, the addition of co-stabilizer has a paradoxical effect on nanoparticle stabilization. F3 that contain SLS as stabilizer has PS 837.8 ± 0.0 nm and F4 that contains Tween80 has 409.9 ± 13.5 nm. The addition of co- stabilizer in these formulations provides large particle size indicating poor stabilization, and their combination was not appropriate for azilsartan medoxomil nanosuspensions. The addition of surfactants (SLS and Tween80) is not always beneficial for particle size reduction. Surfactant addition might hinder the interaction between the polymer and drugs and increase the particle size for some drugs . Formulation F11 that contain PEG6000 as the primary stabilizer the story were different. In F12 that utilize SLS as co-stabilizer, the particle size increased to 691 ± 23.7 nm as compare to 539.3 ± 45.8 nm in F11.In another hand the addition of Tween80 as co-stabilizer there was a dramatic reduction in particle size as seen in F13 which has PS 48.7 ± 0.5 nm. Electrostatic and steric stabilization are created to provide an energetic barrier that prevents agglomeration between nanoparticles, it is imperative whether the stabilizers could coat the particle surface immediately and entirely . Two formulations ( F8, and F17) at a constant drug: stabilizer ratio 1:1 at stirring speed of 1200 rpm were utilized to show the effect of high power energy of probe sonicator at 400 watt on PS and PDI. If we compare the formulas of F6, and F15 that developed with the same condition as above formulations without using probe sonicator, these formulas have particle size 399.7 and 332.6 nm respectively. The corresponding formulas ( F8, and F17) that prepared with the additional step of using ultrasonication power at 400 watts for 20 minutes have a particle size of 101.8 and 116.2 nm. These results reveal that there are significant decreases in particle size of the prepared formulations. The effect of ultrasonication power is shown in Figure 6. Also, the PDI of these formulations was in the range of 0.26-0.48 which is in the acceptance range. 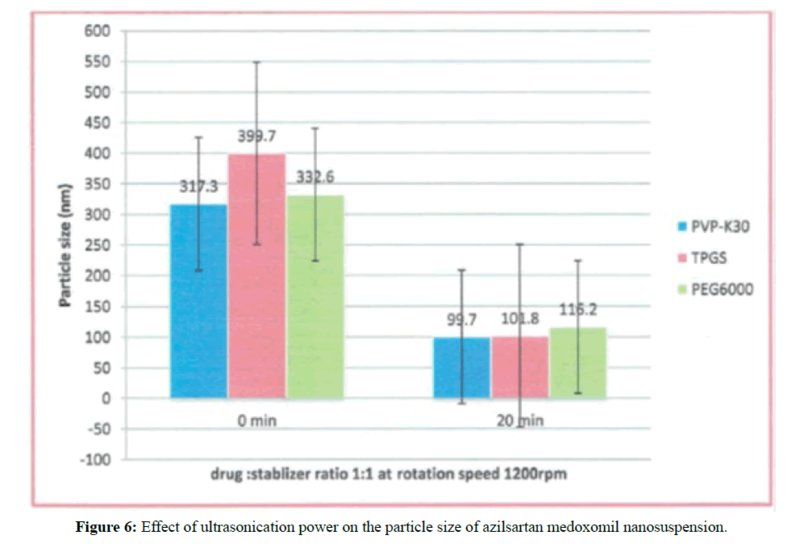 Figure 6: Effect of ultrasonication power on the particle size of azilsartan medoxomil nanosuspension. The principle of this ultrasonication is that cavitation fields generated which result in the formation of bubbles. These bubbles aid in creating turbulent flow condition which guarantees the mixing and atomization of the organic solutions during addition to the aqueous stabilizer solution . Three different speeds 300, 1200 and 3500 rpm was used to formulate three formulations at the drug: stabilizer ratio 1:1 of each primary stabilizer used. F5-F7 and F14-F16 are formulated to show this effect. In this study the optimum stirring speeds at a drug to stabilizer ratio 1:1 for formulations that contain TPGS and PEG6000 as stabilizers found 3500 rpm that produce mean particle size 242.4 and 177.4 in formulations F5 and F14 respectively. This effect is shown in Figure 7. 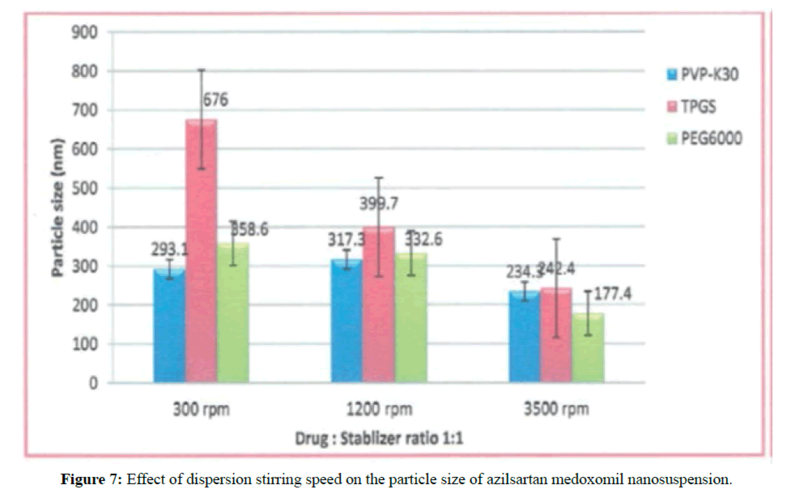 Figure 7: Effect of dispersion stirring speed on the particle size of azilsartan medoxomil nanosuspension. In these formulations, on increasing the stirring rate from 300 to 3500 rpm smaller nanoparticles obtained. This result shows sufficient energy input required for the production of a nanosuspension with a narrow size distribution . From the above result depending on the particle size and PDI the formulations F8 and F13 were selected for further study such as zeta potential, AFM, FTIR. From these formulations, the best one will be chosen for freeze drying and self-dispersibility study. The mean particle sizes of these formulations and their size distribution graph shown in Figure 7 for F8 and Figure 8 for F13. 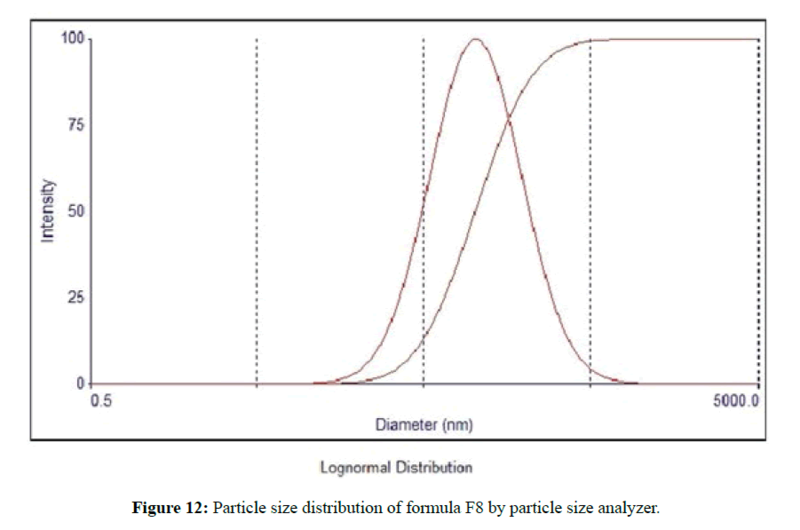 Figure 8: Particle size distribution of the selected formulaS (F8) by nanobrook plus90 particle size analyzer A- for F17 B-for F22. The zeta potential manifests the degree of repulsion between adjacent and similarly charged particles in a dispersion medium . The formulation F8 that stabilized with nonionic stabilizer TPGS need high zeta potential since the stabilizer layer is relatively thin and provided poor stabilization. The value of ZP obtained for F8 (-35.1) which is considering enough for stabilization of such nanosuspension. The reason for this is that TPGS has a steric stabilization effect by its PEG part in the molecule . When stabilization based on steric stabilizers, the measured zeta potential is lower because the adsorption layer of the stabilizer shifts the plane of shear, in which the zeta potential is measured, to a far distance from the particle surface. In some such cases, absolute values of ZP of 20 mv consider sufficient for stabilization due to steric effect . In formula F13 combination of Tween80 non-ionic surfactants with steric stabilizer, PEG6000 provide a value of ZP -25.25 mv which could assure the long-term physical stability of formulations due to steric and electrostatic effect . The plot of Zeta Potential distribution for selected formulation F13 is represented in Figure 9. Figure 9: Plot of zeta potential distribution for selected formula F13. 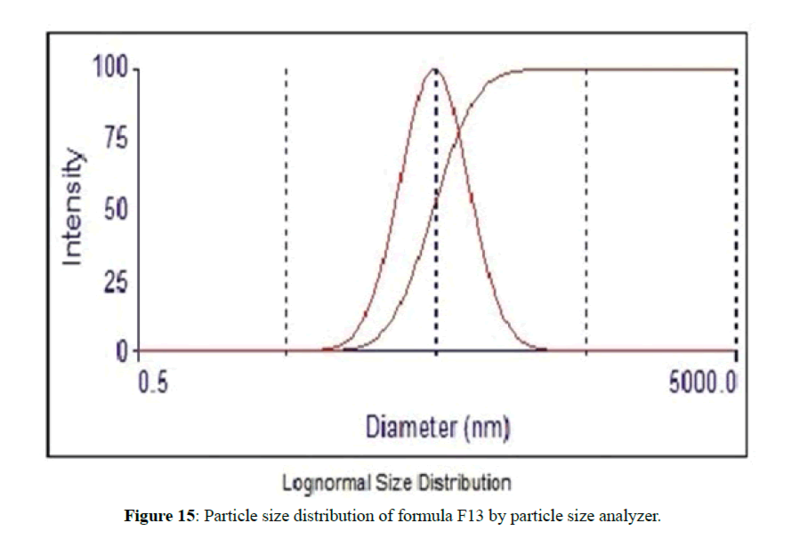 The morphological analysis and particle size of formula F8 performed by AFM showing nearly spherical as shown in Figure 10 and Figure 11 represent the histogram of particle size distribution for the formula and Figure 12 for particle size distribution by particle size analysis. While for formula F13 the AFM show spherical particle shape and particle size about 70 nm which is larger than that obtained by particle size analyzer (48.7 nm). 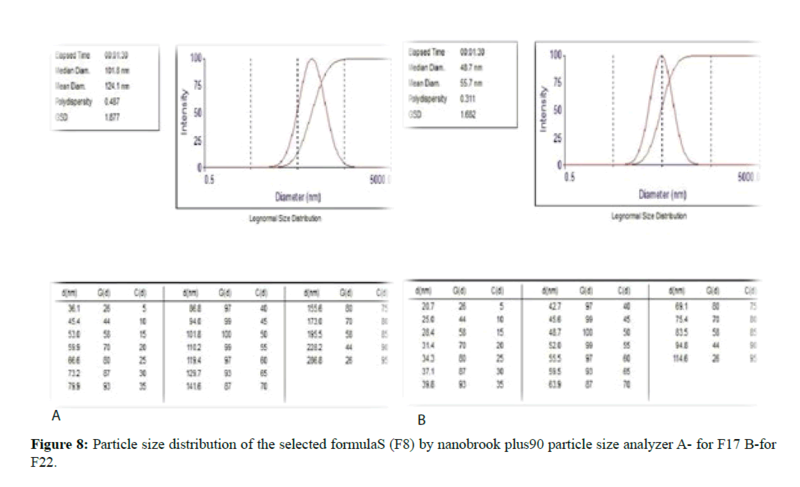 Formula F13 represented in Figure 13 for the morphology of nanoparticles and Figure 14 for a histogram of particle size distribution compared to the Figure 15 obtained by particle size analysis. 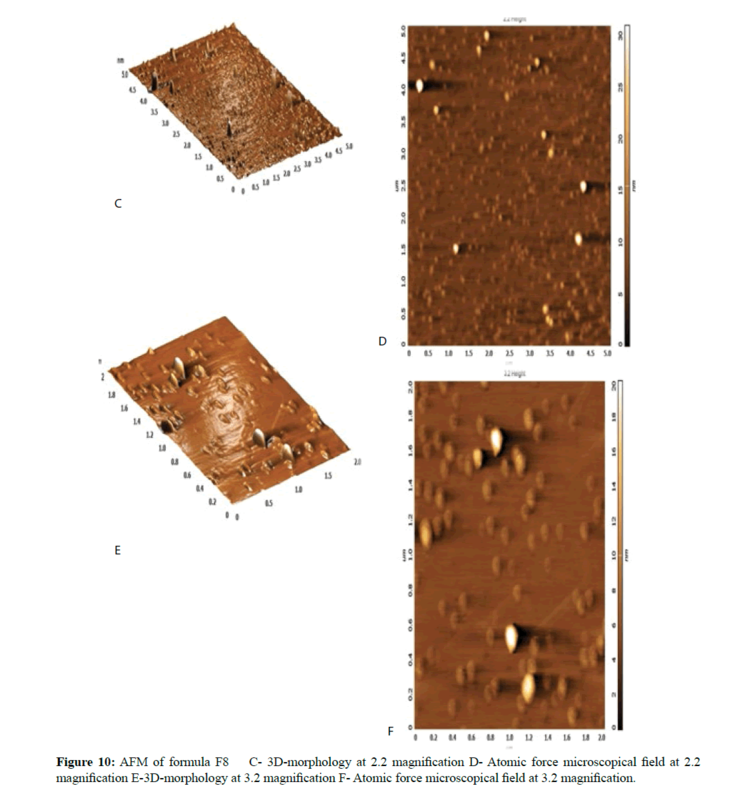 Figure 10: AFM of formula F8 C- 3D-morphology at 2.2 magnification D- Atomic force microscopical field at 2.2 magnification E-3D-morphology at 3.2 magnification F- Atomic force microscopical field at 3.2 magnification. 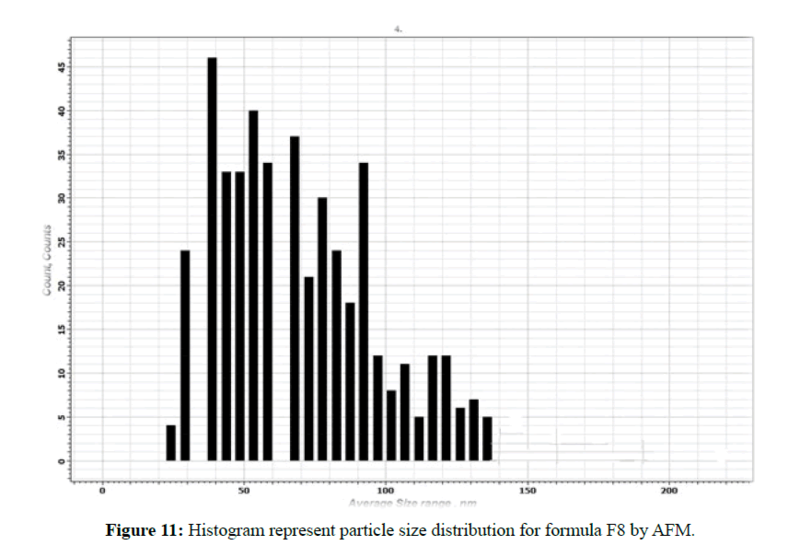 Figure 11: Histogram represent particle size distribution for formula F8 by AFM. Figure 12: Particle size distribution of formula F8 by particle size analyzer. 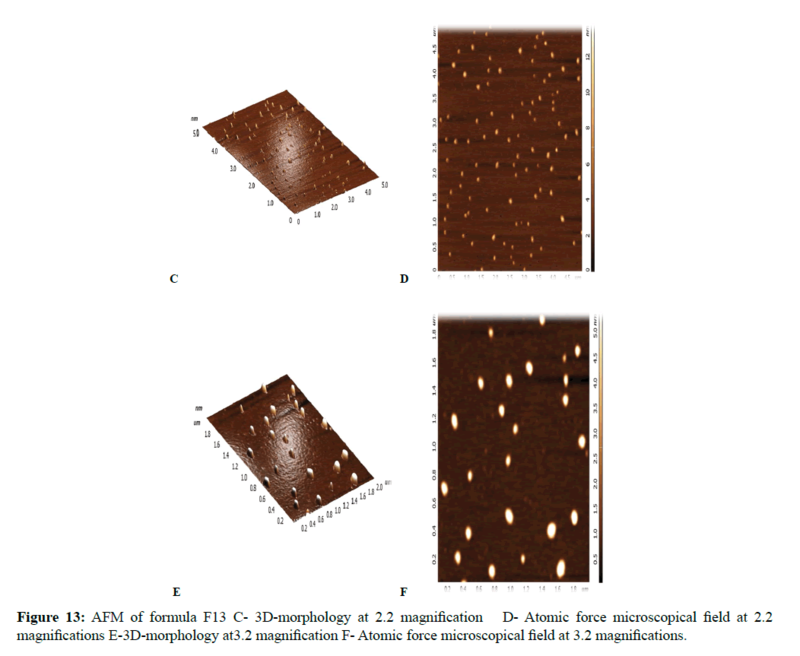 Figure 13: AFM of formula F13 C- 3D-morphology at 2.2 magnification D- Atomic force microscopical field at 2.2 magnifications E-3D-morphology at3.2 magnification F- Atomic force microscopical field at 3.2 magnifications. Figure 14: Histogram represents the particle size distribution of formula F13 by AFM. Figure 15: Particle size distribution of formula F13 by particle size analyzer. All the selected formulas were found to be stable, and no aggregation of particles could be observed . The small variation because particle size analyzer is only capable of giving information about the volumetric mean diameter of a large number of nanoparticles . The resultant nanosuspension has to be additionally dried to be applied to the development of the tablet or capsule, which are major oral dosage forms. Furthermore, once the prepared dry powder immersed in the aqueous medium, it should be separated and redispersed into the original nanoparticles with equivalent size, hence restructuring the nanosuspension, to attain their predictable pharmaceutical performances. The dried particles which can be spontaneously transformed to monodispersed suspension in an aqueous fluid such as digestive juices are called dry nanosuspension . 1) No other additive (without cryoprotectant) formulated as (F13w). 2) Mannitol or trehalose as a cryoprotectant was dissolved in nanosuspension before freeze-drying to formulate F13m and F13t respectively. It was found that the dispersibility was improved when using mannitol as cryoprotectants and products were spontaneously dispersed into primary azilsartan nanosuspension within 1-3 min in both media (0.1 N HCl and phosphate buffer pH 6.8). Also using trehalose provide fast dispersibility but less than that obtained by mannitol. It suggested that mannitol in the products would improve the wetting of the hydrophobic drug and accelerate the penetration of water into the products. On the other hand, the products without cryoprotectants could not be dispersed well and transformed into the original nanosuspension within 15 min as expected from their agglomerated structure. Wang et al. reported that the nanoparticle agglomeration occurs as a result of the capillary pressure forces encountered during the freeze-drying process . The particle size distributions of three freeze-dried products evaluated after redispersion by particle size analysis. However, particles were widened to larger particle range as seen in Table 5. As a result, dry nanosuspension of azilsartan medoxomil will be converted to original nanosuspension in the GIT fluids. The present result suggested that cryoprotectants were needed to save particle size distribution in the nano size if small amounts of (PEG6000 and Tween80) coexist as a stabilizer as in F13 for preparing dry nanosuspension of azilsartan medoxomil . The obtained results of the solubility study for azilsartan medoxomil indicated that pure powder possesses a very low solubility in phosphate buffer (pH 6.8) and particularly insoluble in 0.1 N HCl, while the saturation solubility of azilsartan medoxomil in self-dispersible lyophilized powder is illustrated in Table 6. The results show that there is several folds increase in saturation solubility for all the self-dispersible formulations. The reduction of the particle size of azilsartan medoxomil to the nanoscale increased surface area and enhanced hydrophilicity by using hydrophilic stabilizer and surfactants were responsible for the increased saturation solubility. In vitro drug release studies of azilsartan medoxomil, nanosuspension containing selected formula ( F13) and the pure drug was conducted in 0.1 N HCl and phosphate buffer pH (6.8) to simulate in vivo release in both stomach and intestine . 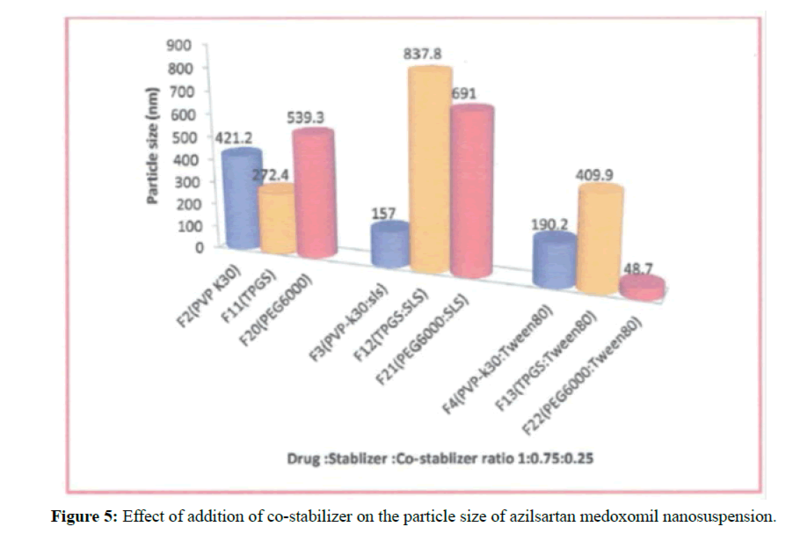 Comparison between the dissolution profiles of azilsartan medoxomil from the selected formulation with pure powder of drug was made using similarity factor f2. Value of f2 greater than 50 (50–100) mean similarities of the dissolution profiles. It was observed that the dissolution profiles of the selected formulation (F13) of azilsartan medoxomil nanosuspension, when compared with the pure drug as a reference, their f2 values were lower than 50 as shown in Table 7 so that there was no similarity. Results indicate a significant increase in dissolution rate (P< 0.05) of all the selected formulas of azilsartan medoxomil nanosuspension than the pure drug powder in both dissolution media as shown in Figure 16 for in-vitro release in 0.1 N HCl and Figure 17 in phosphate buffer pH 6.8. These results expected according to Noyes– Whitney equation where the dissolution rate is directly commensurate with its surface area exposed to the dissolution medium and saturation solubility of the prepared drug dosage form . The release profiles of the prepared azilsartan medoxomil self-dispersible dry nanosuspension (F13m and F13t)) were tested in the same media used for dissolution of the original nanosuspension as shown in Figures 20 and 21 respectively. Results obtained from these formulations will be compared using similarity factors f2 with the aqueous nanosuspension (F13) before lyophilization. The dissolution parameters in both dissolution media shown in Table 8 that can give an idea about the release behavior of each formula. In both dissolution media, the dissolution rate of azilsartan medoxomil from the dry nanosuspension was rapid. The similarity factor obtained for both formulations was more than 50 which means there is no considerable difference in the dissolution rates of liquid and self-dispersible dry nanosuspension indicating that lyophilization process does not affect the diffusion pattern of azilsartan medoxomil nanoparticles. For lyophilized dry nanosuspension, cryoprotectants did not decrease the dissolution profile of self-dispersible azilsartan medoxomil dry nanosuspension in the selected formula F13. This lead to complete dissolution within few minutes as original nanosuspension . 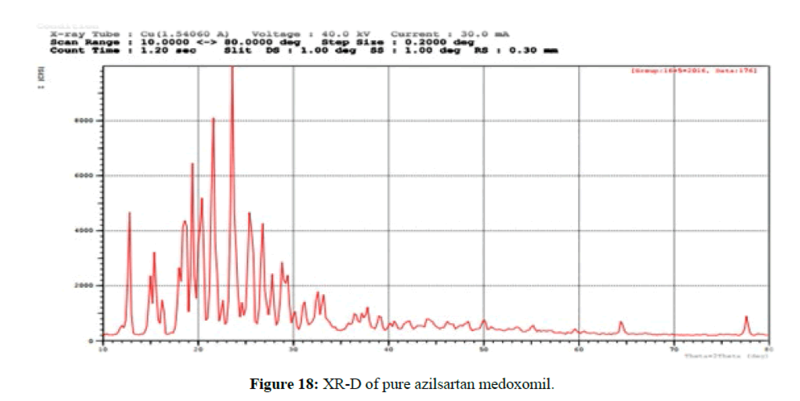 The XRD patterns of azilsartan medoxomil as a pure drug powder showed sharp diffraction peaks and this presented in the Figure 18 which indicate the crystalline nature of the pure azilsartan medoxomil powder. Azilsartan medoxomil shows sharp crystalline peaks at 2θ from 13° to 27°, and the strongest three peaks appear at 23°, 21°, and 20°. However, these characteristic peaks of drug disappeared in the pattern of self-dispersible lyophilized powder of azilsartan medoxomil nanosuspension in the formulations (F13m) as seen in Figure 19 producing a diffused pattern of very low-intensity peaks and absence of the peaks corresponding to the pure azilsartan medoxomil pure powder. This result indicates that azilsartan medoxomil in the lyophilized self-dispersible powder is in an amorphous state . Figure 18: XR-D of pure azilsartan medoxomil. Figure 19: XR-D of selected formula F13m self-dispersible dry azilsartan medoxomil nanosuspension. The FTIR spectrum of pure azilsartan medoxomil powders as in Figure 20 display a characteristic absorbance band due to C=O stretching vibrations of carboxyl functional group at 1776.3 cm–1, band associated with C–O stretching appeared at 1280.7 cm–1 and 1309 cm–1. The stretching vibration of C-O-C perform at 1083.9 cm–1, N-H bending of amine group at 1467 cm–1, C-H bending out of plane at 761.8 cm–1, and C=N stretching at 1691.5 cm–1. These are the main characteristic absorption band of azilsartan medoxomil. The FTIR spectrum of the best-selected formula of the prepared azilsartan medoxomil self-dispersible dry nanosuspension (F13m) is shown in Figure 21. It is clear that the major characteristic peaks of azilsartan medoxomil are found in this figure with very miners shifting of some peaks due to the high amount of cryoprotectants (mannitol) in the formula. This finding indicates there is no interaction between the drug azilsartan medoxomil and excipients of this formula. 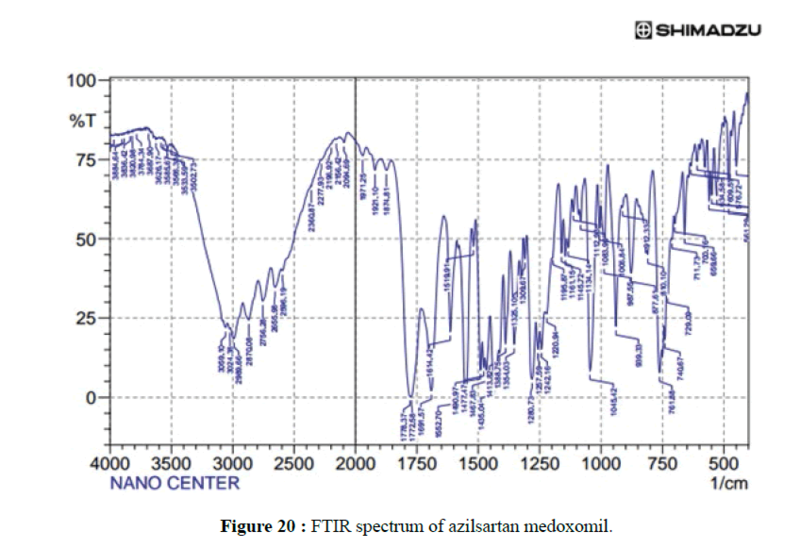 Figure 20: FTIR spectrum of azilsartan medoxomil. 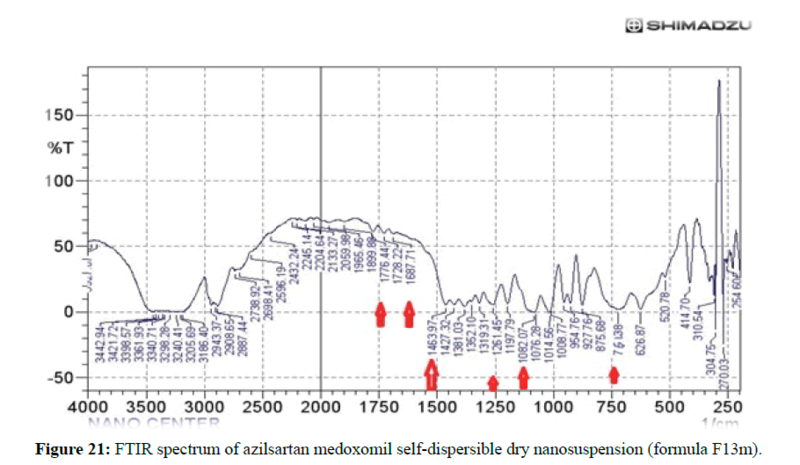 Figure 21: FTIR spectrum of azilsartan medoxomil self-dispersible dry nanosuspension (formula F13m). Where t90% is the time required for a drug to lose 10% of its potency, and it was found to be 1.26 years. We conclude from the study antisolvent-precipitation with ultrasonication method is an efficient method to prepare azilsartan medoxomil nanosuspension and it is cost-effective and easy to formulate azilsartan medoxomil selfdispersible dry nanosuspension with high solubility and dissolution rate. We are very thankful to the ministry of science and technology, research and material department, Iraq; for providing the necessary facilities that help to complete our work. All the authors have contributed equally. Leuner C., et al., European Journal of Pharmaceutical Sciences, 2000. 50: 47-60. Lakshmi P., et al., International Journal of Pharmacy and Pharmaceutical Sciences, 2010. 2: 35-40. Rabinow B., Nature Reviews Drug Discovery, 2004. 3: 785-796. Kesisoglou F., et al., American Association of Pharmaceutical Scientists Journal, 2012. 14: 677-687. Sheetal B., et al., International Journal of Institutional Pharmacy and Life Sciences, 2015. 5: 262-280. Sweetman C.S., The Complete Drug Reference, Pharmaceutical Press, Thirty-Seventh editions, 2011. 1345-1346. Gandhi S., et al., Pharma Science Monitor, 2015. 6: 224-232. Kumkum S., et al., International Journal of Applied Pharmaceutical and Biological Research, 2016. 1: 105-111. Vikram M., et al., Der Pharmacia Lettre, 2011. 3: 129-140. Dandan L., et al., American Association of Pharmaceutical Scientists Pharmaceutical Science & Technology, 2012. 13: 295-304. Shekunov B.Y., et al., Pharmaceutical Research, 2007. 24: 203-227. Khachane P.V., et al., Saudi Pharmaceutical Journal, 2015. 23: 188-194. Nakrani M., et al., Scientia Pharmaceutica, 2010. 78: 345-361. Chaubal M.V., et al., Pharmaceutical Research, 2008. 25: 2302-2308. Niwa T., et al., European Journal of Pharmaceutical Sciences, 2013. 50: 272-281. Raval A.J., et al., International Research Journal of Pharmacy, 2011. 1: 83-89. Sahu B.P., Applied Nanoscience, 2013. 4: 1-9. Coasta P., et al., European Journal of Pharmaceutical Sciences, 2001. 13: 123-133. Dabhi M.R., et al., Asian Journal of Pharmacy and Pharmacology, 2015. 9: 102-113. Ige P.P., et al., Colloids and Surfaces B: Biointerfaces, 2013. 108: 366-373. Parveen R., et al., Journal of Pharmacy and Bioallied Sciences, 2015. 7: 321-324. Detroja C., et al., Scientia Pharmaceutica, 2011. 79: 635-651. Iswariya V., et al., Formulation development and optimization of extended release matrix tablet of azilsartan using natural and synthetic polymers. per, 2016. 3: 294-304. Gadad A., et al., International Journal of Pharmaceutical Sciences and Nanotechnology, 2012. 5: 1727-1734. Choi J.Y, et al., Current Applied Physics, 2005. 5: 472-474. Glosh I., et al., International Journal of Pharmaceutics, 2011. 409: 260-268. Sinha B., et al., International Journal of Pharmaceutics, 2013. 1-15. Liu Y., et al., Journal of Pharmacy and Pharmaceutical Sciences, 2010. 13: 589-606. Lee J., et al., International Journal of Pharmaceutics, 2008. 355: 328-336. Rachmawati H., et al., Journal of Pharmacological Science, 2013. 102: 204-214. Pu X., et al., Formulation of nanosuspensions as a new approach for the delivery of poorly soluble drugs. Current Nanoscience, 2009. 5: 417-427. Jain V., et al., Acta Poloniae Pharmaceutica Drug Research, 2011. 68: 273-278. Kutschera H.L., et al., International Journal of Pharmaceutics, 2010. 402: 6471. Mishra P.R., et al., International Journal of Pharmaceutics, 2009. 27: 182-189. Peltonen L., et al., Journal of Pharmacy and Pharmacology, 2010. 62: 1569-1579. Honary S., Tropical Journal of Pharmaceutical Research, 2013. 12: 265-273. Bailey N.A., et al., Nano Science and Technology Institute -Nanotech, 2006. 2: 739-743. Sandhya J., et al., International Journal of Pharmaceutical Sciences Review and Research, 2014. 24: 177-181. Wang B.H., et al., Dry Technol, 2005. 23: 7-32. Van-Eerdenbrugh B., et al., European Journal of Pharmaceutical Sciences, 2008. 35: 344-353. Van-Eerdenbrugh B., et al., International Journal of Pharmaceutics, 2007. 338: 198-206. Patel P.V., et al., International Journal of Pharmaceutical Investigation, 2013. 3: 95. Mahapatra A.K., et al., Journal of Chemical and Pharmaceutical Research, 2014. 6: 1099-1106. Alam M.S., et al., International Journal of Pharmacy and Pharmaceutical Sciences, 2012. 4: 371-374.